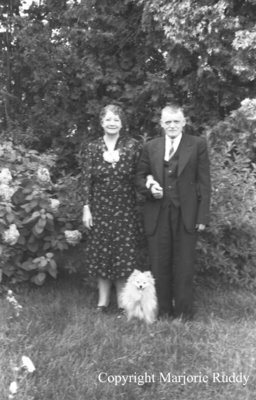 A black and white negative of Mr. and Mrs. Bidding standing outside in front of trees. In this view Mrs. Bidding has her arm through Mr. Bidding's arm. Their dog is sitting at their feet. Mr. and Mrs. Bidding, 1941, Marjorie Ruddy. Whitby Archives A2013_040_914D.